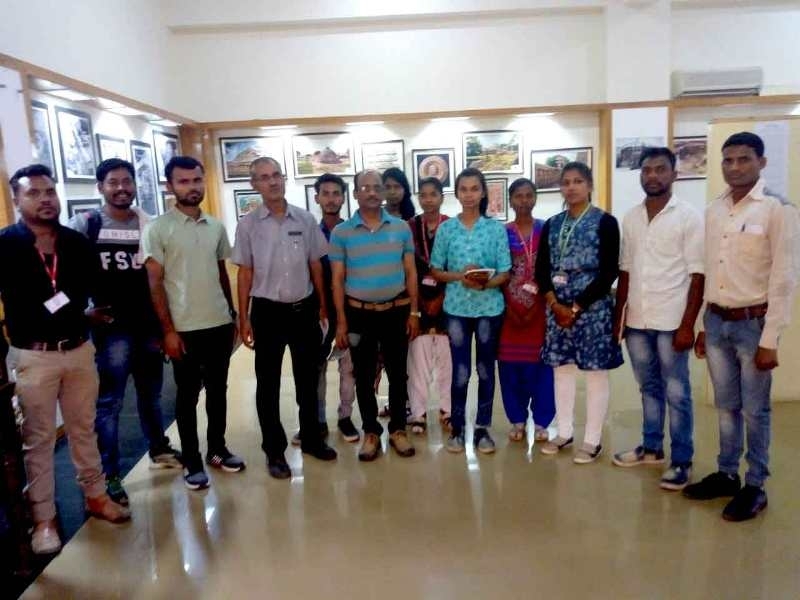 Bhopal: A team consisting of 12 students of Indira Gandhi National Tribal University, Amarkantak led by the Head of the Department of Ancient Indian History, Culture and Archeological department, Prof. Dr. Jinendra Jain saw 18 galleries of State Museum, Shyamla Hills, Bhopal besides photo exhibition focusing ‘Madhya Pradesh ki Puratatvik Dharohar’ today. The Keeper of State Museum B.K. Lokhande elaborated students on methods, techniques of excavation to explore prehistoric and post historic settlements, what kind of relics are found there, how study is conducted on relics, how to ascertain the period and techniques to determine the period. Member of the students’ delegation Smt. Nisha Patel and Ganesh Merawi informed that the material displayed at the State Museum are historical and remarkable. They said that whatever importance the items displayed at the museum holds, it is become easy for students like us to study any subject, if a person is cable to make us understand the archeological importance of the material. The team has impressed by the information provided by Lokhande as regard to prehistory and post-history period.